By default, Magento uses the .html extension in all catalog based URL’s and quite often a site may launch using this default URL format. Most Magento store owners will be aware that from the Magento admin, you can easily remove the default .html extension from the URL’s (like the screenshot below) but once a store has already gone live and there are already thousands of the .html URL’s indexed in search engines or many backlinks pointing the .html URL’s, you should implement a global 301 redirect to handle the redirecting of all URL’s containing a .html extension to the counterpart without. 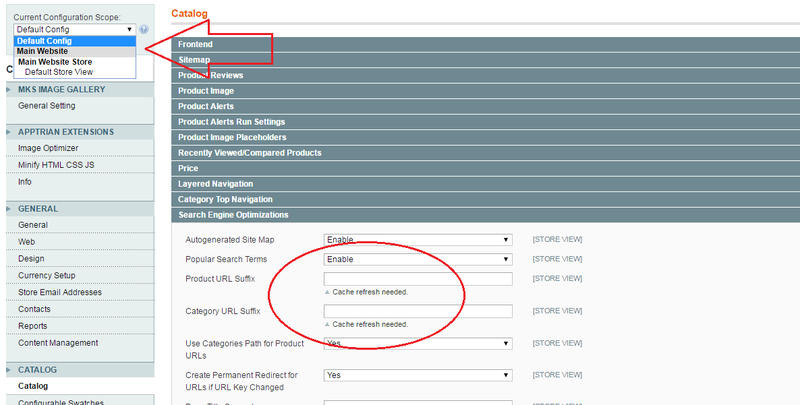 You can access the above with your Magento admin at System > Configuration >CATALOG > Catalog > Search Engine Optimizations and then the Product URL Suffix and Category URL Suffix will contain the .html extension that you can remove. This rule may require to be implemented in different ways from store to store depending on the setup and any other rewrites it may have in place. We have remove .html from product suffix, reindexed and recached. As this didn’t work we assumed it must be something to do with an incorrectly configured htaccess file so reinstalled default magento htaccess and then added the piece of code above. 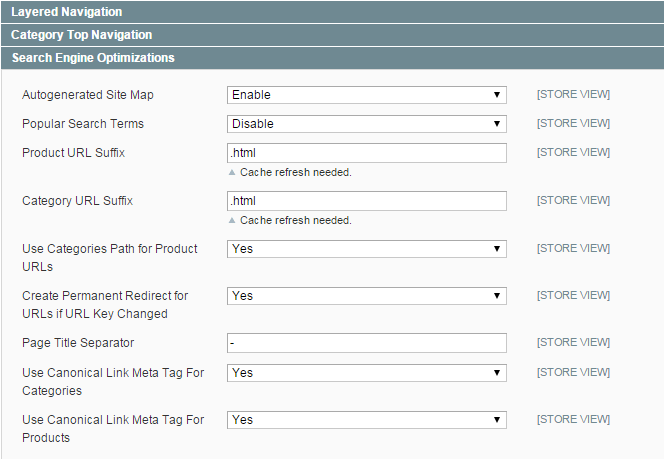 Disabled plugins which we know affect URL structure (manadev and creare); still nothing…. Hey Vicki, thanks for leaving a comment. So just to clarify then, after all of the above, all your URL’s still contain .html at the end of them? One thing that might be worth trying is toggling your store scope in the system configuration to ensure that .html isn’t added as a suffix for your actual store website/store view in addition to default config.